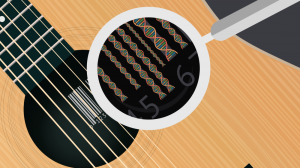 From high-end guitars to bolts that keep the wings attached to military aircraft, manufacturers are turning toward DNA to catch counterfeit products. A look inside the technology that’s sending crooks to jail in ways Sherlock Holmes only dreamed of. Josh Davis dreamed of touring the United States with his rock band. He never dreamed the FBI would be in the audience. Through the mid-2000s, the Josh Davis Band played Tucson, Arizona and Sioux Falls, South Dakota; Reno, Nevada and Little Rock, Arkansas; Dallas, Texas and Cheyenne, Wyoming; Bozeman, Montana and Tallahassee, Florida. The band earned extra cash selling guitars to pawn shops, hawking brands such as Gibson, Guild, and Martin. They sold each instrument for about $400 and used the cash to pay for gas, hotels, and food. None of the guitars were authentic.